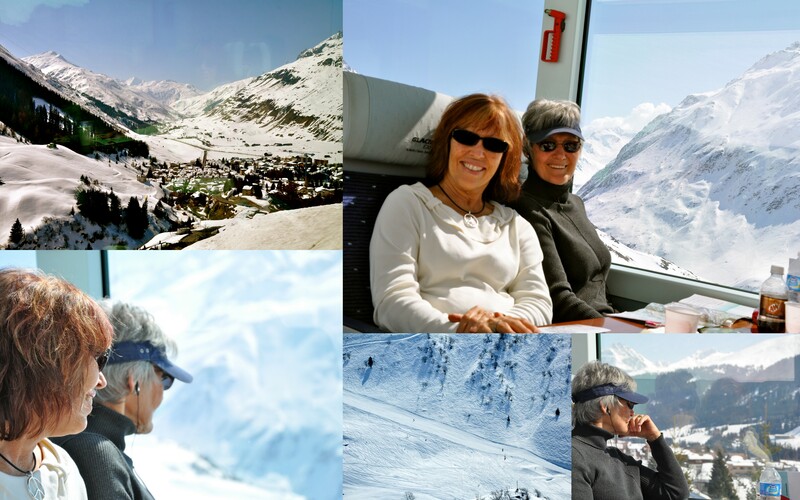 You may recall from the blog we took the Glacier Express to St. Moritz this winter. When we took it while Gabe’s family was here, it was equally as beautiful only half covered in snow. Starting out in Zermatt and heading to Brig. Not much snow at all this time! We love watching the wonder on everyone’s faces! Continuing on through Fiesch, Reckingen, Muster, Fulka and the canton of Ori. Everyone in awe in Andermatt. It’s my favorite on the ride, too! 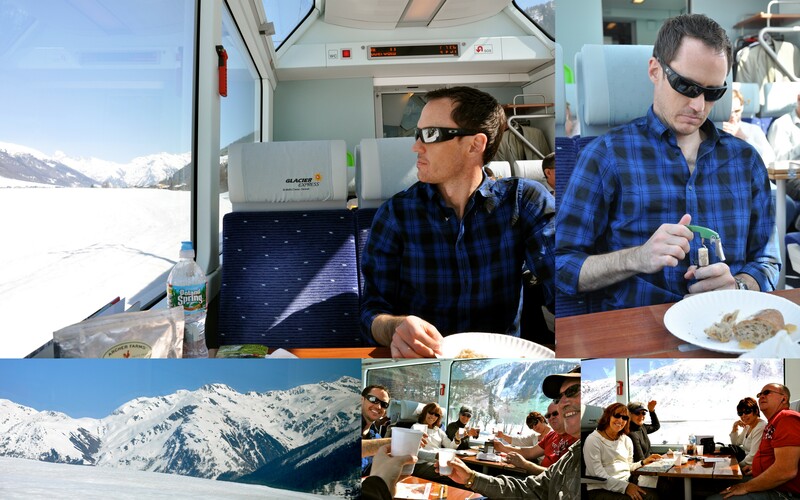 Cutting through the Rhine Gorge, passing through Davos and reaching our destination of Klosters. 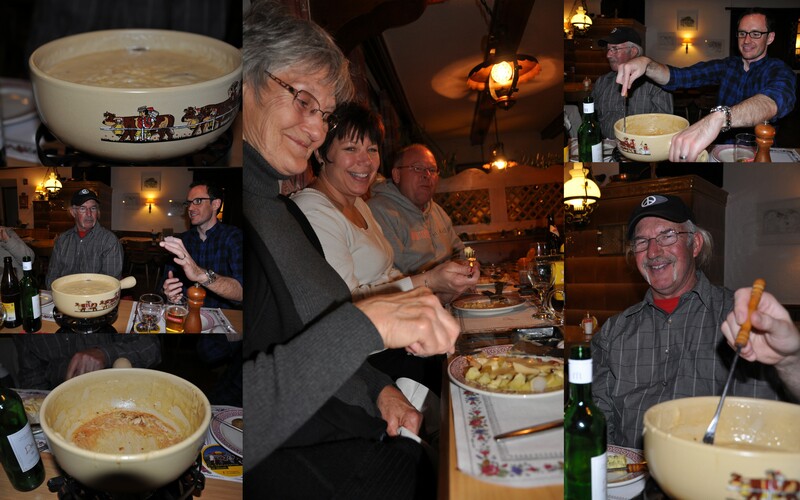 Enjoying their first Swiss fondue and raclette in Klosters. Since the raclette was Type 2 and served without meat, the group favorite was the mushroom fondue. We were the only ones in the restaurant with an exclusively German-speaking owner. It was a really awkward fun experience! We stayed at the Swiss Sport hotel in Klosters. 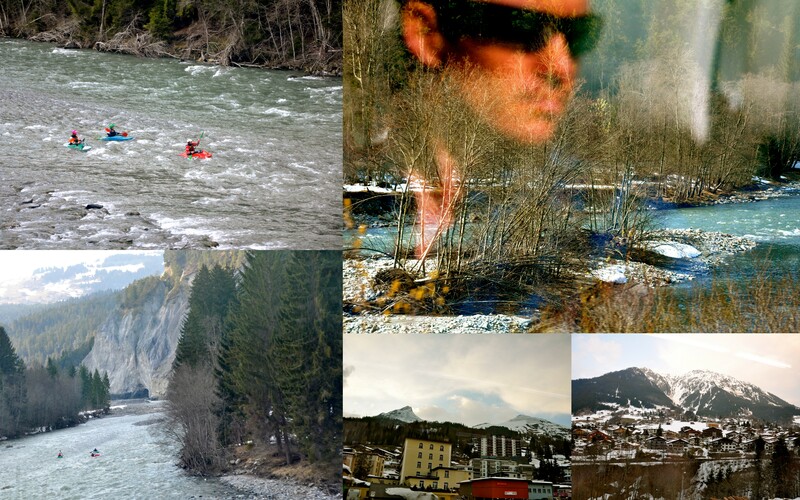 We found Klosters to be small and tranquil – not a place for late night action. We had to create our own! The evening was fun of laughter and fun. Don’t let The French Cougar tell you that is water in her hand – we believe its wine! Also don’t even ask why Dunkel and Sweet Wine have those amused looks on their faces. What happens in Klosters stays in Klosters! A bonus is that The Gladiator and Mama Mia celebrated their wedding anniversary on this stint of the trip. We are so glad we got to spend it with them! 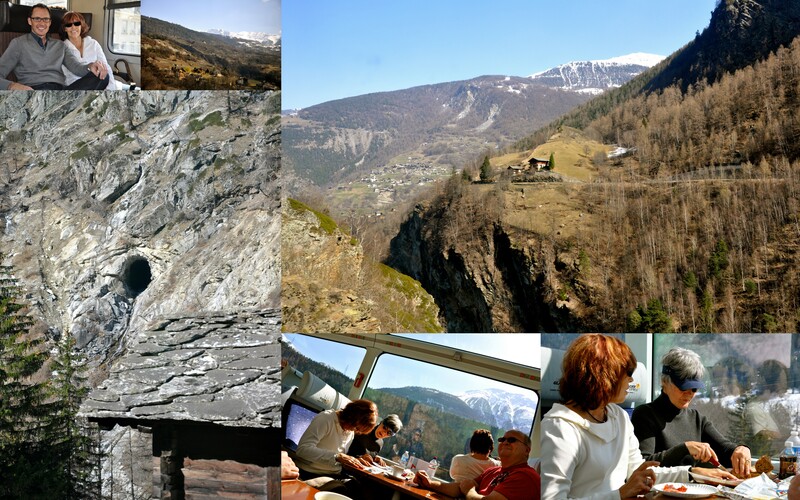 This entry was posted in Alps & Other Big Mountains, Daytrips from Geneva, Food, Wine & Beer, Spring, Swiss Foods, Travel: Within Switzerland, UNESCO sites, Visits & Trips with Visitors. Bookmark the permalink. Hi! 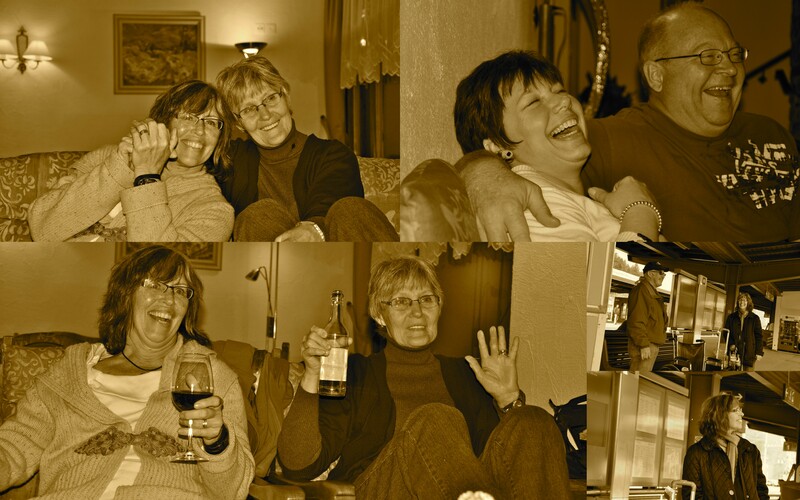 I am a friend to Reta and your mother-in-law Pat. Two wonderful people! I just want to say that I really enjoy your pictures and writings. They are fabulous and makes me wish I could come to Switzerland! Keep sending the pics. Hi Barbara! Thanks so much for reading our blog. It is fun for us to share our stories with friends and family. Feel free to come anytime!